Lisa's color is lavender (L for Lisa / L for Lavender .. gosh, aren't we too, too clever? Well, it really helped with color-coding possessions when she and Rene were small). The binding was leftover yardage from a Christmas dress made years and years ago. Yes, it really does pay to be a pack-rat and horde all those pieces of fabric that you might otherwise think are useless! Lisa, for whatever reason, likes moose. Meese? Mooses? You know, those big, humungous animals in the Great Frozen North. I have no idea why. Ummm.. that is, I have no idea why she likes moose; I assume the moose like being in the GFN cuz that's where they live .. but they have never actually told me. 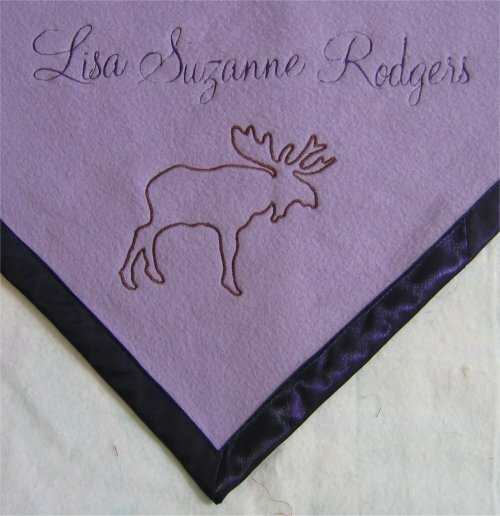 Anyway, I found an applique for a moose .. the whole enchilada, so to speak ... as well as other moose designs. She liked the whole enchilada, but without any fabric for the applique part. The result was simply an outline form. The moose applique was obtained from www.knothole.net/SusanMona1.html, but that website is now unavailable and the moose design with it. What a shame ... I even did a search for it on some other sites but came up empty handed. An email to the digitizer, Susan Mona, bounced back as undeliverable. The alphabet is Magenta from SCK's Yahoo group, "sickdesigns". Free Font of the Month downloads (plus archives) are available when you join the group. The script letters (upper case, lower case and numbers) are beautifully formed, stitch out lovely and are just visually gorgeous. So, what was the Learning Experience here? Well, at this point, I hadn't learned how to align seperate design elements when they were stitched independently. That's why her first, middle and surnames are slightly askew. However, it doesn't negatively affect the warmth of the blanket and Lisa likes it. Aren't daughters great?